Coping with anxiety can be really tough and it’s one of the most common mental illnesses. I used to struggle with panic attacks and social anxiety and it really started to consume my life. With time I have been able to mostly overcome my anxiety by doing extensive work with a therapist. 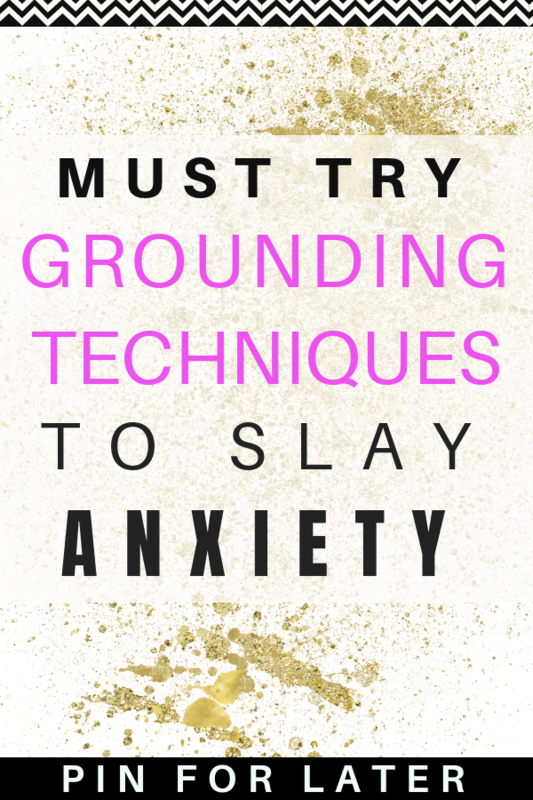 However, I wanted to share the grounding techniques that I learned and used to use that helped me manage my anxiety. 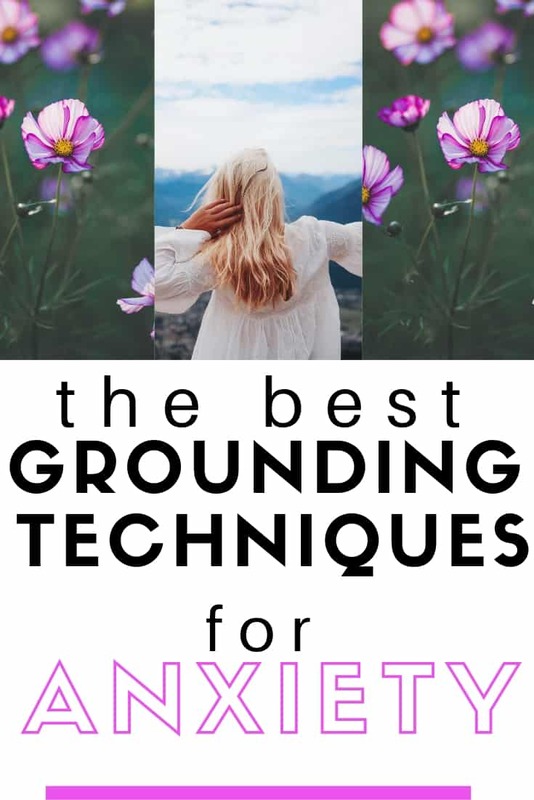 These grounding techniques for anxiety are great tools to have in your pocket if you are struggling with anxiety and they used to be my go to when I felt like my anxiety was out of control. These exercises have also been shown to help with disassociation and they can help you fall asleep if you find you worry a lot at nighttime. Grounding exercises help take you out of your head and into the present moment. Using grounding techniques allows you to intentionally seek out calm and find some peace when you are very anxious. Most of the time when we are anxious we are worrying and are really wrapped up with whatever terrible scenario is in our heads. Grounding techniques bring your awareness back to your body and the present moment. When I had anxiety I would often find myself stuck in a spiral of anxious thoughts that I couldn’t get out of. Doing grounding techniques helped me interrupt the chain of anxious thoughts and allowed me to find some peace. The exercises help you intensely focus on your senses so that your mind can’t wander and continue to worry. To practice grounding yourself you want to bring your awareness to your body and the present moment. There are lots of different techniques and I suggest finding two or three that seem l like they will work for you and practicing them on a regular basis. Doing these techniques regularly really helped me and I found that the more often I did them the better I got at them. I suggest doing them throughout the day even when you’re not anxious. If you wait until you are struggling and having anxiety to try the techniques it’s going to be more difficult than if you’re in a calm space. Practicing the exercises when you’re calm will help you get better at them and then they will work more effectively when you’re feeling anxious and really need them to work. The more you practice bringing yourself into the present moment the easier it will be in any situation. The great thing about grounding exercises is that they can be done anywhere. You don’t need any special equipment or anything to do them. This means you can use them whenever your in a situation that is starting to make you anxious. I suggest doing the techniques right when you feel your anxiety starting. The sooner you can interrupt your anxious thoughts the easier it is going to be to ground yourself in the present moment. If you wait until you’re really anxious or about to have a panic attack you might find it difficult to focus on the grounding technique and bring yourself in the present moment. Really, you can do anything to bring your attention from whatever you’re worried about to your five senses. Focus intensely on anything you see, taste, touch, hear or smell and try to focus ONLY on that sensation. This way you are breaking the thought pattern that is causing the anxiety and bringing yourself into the present moment. Here are some ideas for grounding techniques you can do but you can also make up your own. Pick out a couple and start doing them throughout the day and start getting really good at clearing your mind and focusing only on your five senses in the present moment. The better you get at it the easier it will be to do it when you’re feeling anxious and need to calm down. 5,4,3,2,1 Method: Look around the room and focus on five things you see. Focus on them very intensely and allow yourself to take them in. Then find Four things you can feel and notice the different sensations in your body. Next notice three things you can hear. Take notice of any static noise you weren’t aware of before (air conditioners, wind, etc). Then notice two things you can smell. Finally, name one good quality you like about yourself or say an affirmation. Grounding Objects: Carry around an object you can feel in your hands when you’re anxious. This can be something like a smooth stone or silly putty. I use a large pendant necklace that I wear most of the time. Hold the object in your hands and really focus on what it feels like. When your mind starts to drift off or start to worry bring your focus back to the object. The point is to only let your mind think about the sensation of the object in your hands. Mindful Walking: As your walking around become very aware of all five of your senses. Notice what you see, hear, touch, taste and smell as you walk. If your mind starts to drift gently bring your attention back to the sensation of the ground under your feet or the sound of the leaves in the trees. Use your senses to bring yourself into your body and the present moment. Meditation: Lately, I have found that meditation has really helped me reach a new level of peace. If you’re struggling with anxiety I really recommend you try it out. I use the Head Space app which has a free ten-day course that teaches you how to meditate. It only takes a few minutes every day and I’ve noticed a huge difference in my well being and how I feel overall. There are also a lot of free guided meditations you can find on YouTube like the one below. Breathing: Focus on taking deep intentional breaths. Bring your awareness to what it feels like when you inhale and exhale. Notice the sound of your breath. When your mind starts to wander gently bring your focus back to your breathing. Self Talk: You can say affirmations in your head such as “I am safe in this moment” and “all uncomfortable feelings will eventually pass”. You can also ask yourself questions to bring yourself to the present moment. Ask yourself questions like what is the date? Where am I? What am I doing? The questions can help bring your awareness back to your immediate reality and help you break the anxious thought cycle. Chair Grounding Technique: Sit down in a chair and close your eyes. Bring your focus on what the chair feels like underneath you and how the ground feels under your feet. Press down on the arms of the chair and bring your attention to the sensation under your fingers. Whenever your mind starts to worry or wander off bring your focus back to how the chair feels. Distract yourself: Play a game with yourself and really focus on it. Whenever you start to have intrusive or anxious thoughts redirect your mind back to the game. You can count backward from 100, play the alphabet game or try to find as many objects of one color as you can. Giving your mind a job to do and something to focus on can help break anxious thought patterns. Use music: Put on a playlist or your favorite song and focus on that. Sing the lyrics or listen really intensely to the music. Try to find sounds or details you’ve never noticed in the song before. If your mind starts to wander off gently bring your focus back to the music. This is great to do if you’re in public and need to ground yourself. Describe your surroundings: Describe your surroundings in great detail as if you are writing them in a book. Notice how the lighting is, what the room feels like and any other small details you notice. When your mind starts to worry bring your focus back to your immediate surroundings and start describing the room to yourself again. You can do this in your mind or write it out in a journal. Essential Oils: I keep a bottle of lavender in my purse for when I feel stressed or anxious. Put a couple drops of essential oil on the inside of your wrist. Take a deep breath and inhale the scent. Close your eyes and focus only on the smell. When your mind starts to wander use the scent to bring you back to the present moment. I hope these grounding techniques for anxiety help you. For years I suffered from panic attacks and I know how difficult it can be to cope with. When I was suffering from anxiety I was constantly afraid my anxiety would get out of control and I would have a panic attack. Practising grounding techniques made me realize that I could control my thoughts and interrupt my anxious thought patterns before they got out of control. It took a lot of practice but it was so worth it. These days I don’t suffer from anxiety on a regular basis anymore. 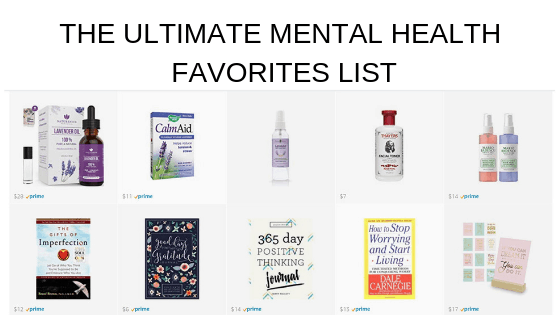 I have a bunch of other posts about anxiety you can check out here if you’re interested in more resources for managing anxiety.